Habitat: Upland, Mountain. 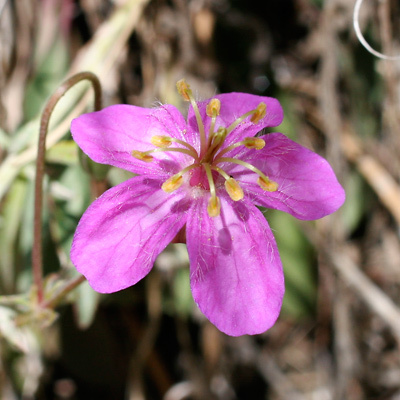 This wildflower grows in mountain meadows, riparian woodlands, and pine forests. Description: The flowers have 5 round-tipped, often reflexed petals, an arching spray of 10 stamens with yellowish to orangish anthers, an elongated style, and 5 pale green, awn-tipped, often reflexed sepals. The petals have darker veins, occasional white streaks, and long, sparse hair near their base. 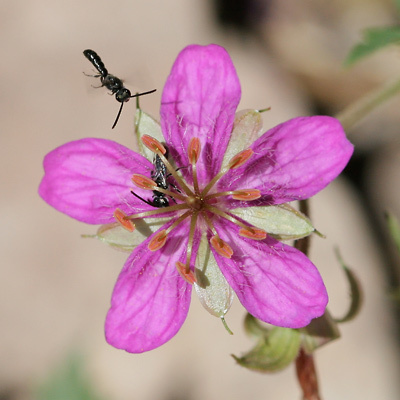 The flowers are followed by beaked seed capsules that resemble a crane bill or stork bill. The leaves are green, hairy, and deeply palmately lobed into 3 main lobes when young and 5 main lobes when mature. 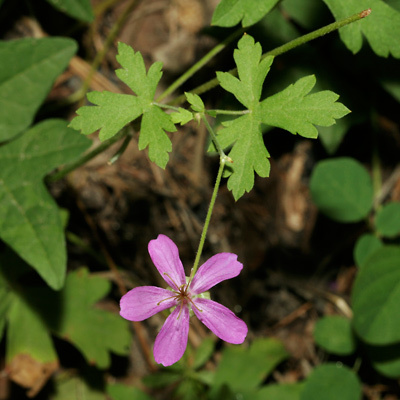 The multiple stems are green to reddish in color, branched, sprawling, and glandular-hairy. 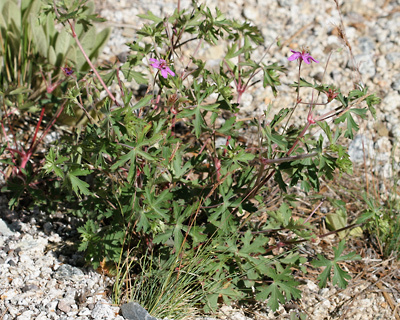 The similar Richardson's Geranium (Geranium richardsonii) has white, pale pink, or pale lavender flowers.